The 2018 Honda Civic Type R’s quintessential color is Championship White, but Phoenix Yellow has also been a Type R signature in the past. Remember how good it looked on the Integra Type R? Well, somebody went through the trouble of properly respraying a Civic in factory-correct yellow and it’s actually pretty awesome. Getting a car painted is not worth blogging about all that often, but I found HondaPro Jason’s respray interesting for a couple key reasons. For one thing, this is a full on factory-style paint job. As you’ll see in his walkaround video here, his body shop straight up disassembled the whole car to properly paint it completely. That must have cost a freaking fortune. Anyway, I really like the dedication to OEMness of this build. 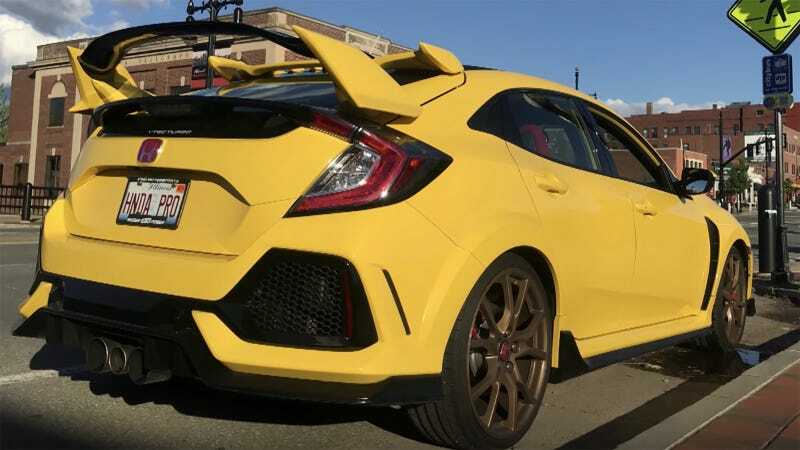 Until Honda actually offers Phoenix Yellow on this car from the factory, this is probably the most stock-looking yellow Civic Type R you’re going to see. Even the stickers have been replaced to make the car look like it was born to be yellow. I’m not totally sure that’s legal, but, it does look nice. And that carbon fiber roof is actually real, which, wow. I have to admit I don’t think I’d ever be brave enough to have someone cut the roof out of my brand new car like a can of beans, but the finished product here looks pretty official. I’m not too sure about HondaPro Jason’s decision to cut more holes in his car’s fake grille, though. Like, I get that it looks way better, but Honda’s engineers spent a lot of time and money dialing in the Civic Type R’s aerodynamics. I have to imagine those grilles were fake for a reason, and now this Civic is going to have a lot more air turbulence in its facial area. Speaking of air turbulence, the dual-wing biplane action is a little much for me. But I do applaud the initiative to make a truly factory-looking Phoenix Yellow Civic Type R, and it looks good enough here that I now think Honda should actually add this to its options list.